No, the Easter eggs we’re talking about are a lot less calorific, but just as fun. They’re bits of code hidden by developers in places you wouldn’t expect, ready to provide the unsuspecting internet user with a bright spot in what might otherwise be a rather ordinary day. Rather than leave you to find them by chance, we thought we’d round up a few of our favourites for you. Because we’re nice like that. 1) Type “Easter egg (media)” into Wikipedia, and hover your mouse over the animal in the bottom right hand corner of the picture. Now click on it. 2) Type Askew into Google. Try not to tilt your head. 3) Search for Loch Ness on Google Maps, then click on the plus button (just once) to zoom in slightly. Now look at the little yellow ‘Street View’ man. 4) One for the Douglas Adams fans: search for “the answer to life, the universe, and everything” on Google. 5) Type Anagram into Google. Get it?? 6) Type “Super Mario Bros” into Google… now click the flashing question mark in the sidebar (make sure your computer’s volume is on!). 7) Search for directions from Buckingham Palace to Windsor Castle on Google Maps. Click the public transport button and scroll down to the last option. 8) Type “do a barrel roll” into Google. 9) For the gamers: Type “Zerg Rush” into Google. If you’re not a gamer and you want to know what Zerg Rush actually is, search “what is Zerg Rush” instead. 10) If you’ve got five minutes to kill: type Solitaire into Google. You’re welcome. What do you think? Fun, aren’t they? We do realise this has nothing at all to do with document scanning, but it’s Easter and everyone deserves a moment to let their hair down and just be downright frivolous for a moment. 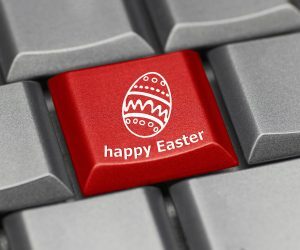 Happy Easter everyone – may the Easter Bunny be generous to you!